Throughout summer we will be running a Pop Up Beach Boot Camp! Classes will include a mixture of full-body cardiovascular and strength workout, including boxercise, circuits and paddle boarding drills. The perfect way to keep fit, get toned, help manage weight and feel great! 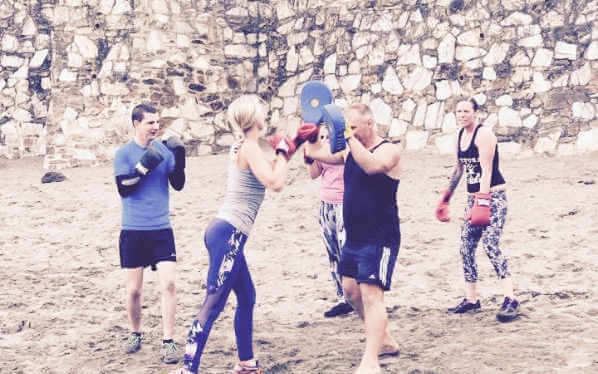 Classes will be led by our resident instructor Grant who as well as having fantastic banter is also fully equipped with a long list of fitness qualifications in disciplines including boxfit, kick boxercise, circuit training, personal training and weight management. He has 10 years experience working as a personal trainer and a wide rage of clients including some rich and famous! He lives by the moto ‘Pain is just weakness leaving the body’! Things to bring: Trainers, towel, a bottle of water, a good sense of humour and your A Game!